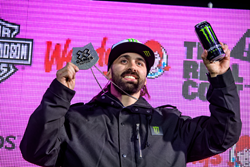 Monster Energy congratulates team rider Brett Turcotte on a strong silver medal finish in Snowmobile Freestyle at X Games Aspen 2019. In a down-to-the-wire final session featuring eight of the world’s top riders, the 30-year-old from Clearwater, Canada, stoked the high-energy crowd at Buttermilk Mountain with his signature blend of technical tricks and smooth style. A few hours earlier, his teammate Casey Currie claimed gold in the first-ever Jeep Wrangler X Challenge obstacle race. After winning gold in last year’s Snowmobile Freestyle and Snowmobile Speed & Style, Turcotte came into tonight’s finals as a clear favorite. Each rider was given two runs to post the highest score on the Snow Park Technologies-designed Freestyle track, and Turcotte came in with confidence and high-difficulty tricks on his first attempt. Right out the gate, the freestyle innovator surprised the crowd with an update on his signature California Roll move: After performing a full 360-degree Body Varial in his seat, Turcotte displayed his unique sled control by landing sideways on the seat with one leg extended. He continued his run by rifling off equally technical and creative moves at maximum airtime, including a huge Tsunami flip, Oxycutioner to Rock Solid, and Coyote Indy – a backflip performed hanging from the handlebar, twisting his body sideways with feet extended – for a 90.66-point score and an early lead. But when the action moved into second runs, Sweden’s Daniel Bodin swiped into the top spot after posting a 91.66-point score. When it all came down to the last attempt, Turcotte continued to send heavy tricks like a fully extended Nac flip, but could not improve on his earlier score, leaving the win to Bodin. With that said, we’ll see more of Turcotte this weekend: The six-time X Games medalist will also be competing in Snow BikeCross and Snow Bike Best Trick, where he finished 5th last year. Will this be his first SnowBike podium? Closely missing the podium tonight, Monster Energy’s Joe Parsons – the world’s most decorated snowmobiler with 17 X Games medals – unleashed a barrage of high-difficulty technical moves onto the course: His signature Gator Wrestler, Cliffhanger to no-handed landing, and Backflip Half Body Varial into a hard-to-control backward landing looked like definite medal material, but Parsons had to settle for 86.33 points and fourth place. Earlier today, the first-ever Jeep Wrangler X Challenge saw athletes from a wide range of action sports – including skateboarding and motocross – take the all-new Jeep Wrangler SUV across a snow-covered obstacle course that tested skills, finesse and precision. When all was said and done, two-time off road racing World Champion and Monster Energy pilot Casey Currie claimed gold by clearing the course in 46.640 seconds. He finished 8.89 seconds ahead of the closest competitor, all-round racing legend Brian Deegan in second place. Born into a motorsports family, Casey Currie began racing motorbikes at age 5 and jumped behind the wheel of his first race truck at 16. He has won trophies riding motorcycles, trucks, and buggies. Usually at home on dirt and desert tracks, today’s win on Aspen’s snow track once again proves his versatility and control. Stay tuned for more action popping off on Buttermilk Mountain, Colorado as Day Three of X Games Aspen presents a massive roster of eight events: Saturday will see the world’s best riders battle it out in Men’s and Women’s Snowboard Slopestyle, Snow BikeCross as well as Adaptive Snow BikeCross and Para Snow BikeCross, the brand-new Snowboard Knuckle Huck, Men’s Ski Big Air, and Women’s Snowboard SuperPipe. ESPN, ESPN2 and ABC will televise a combined 15.5 hours of live X Games Aspen 2019 competition, which will also be accessible via the ESPN app and WatchABC to viewers who receive their video subscription from an affiliated provider. In addition, all 15.5 hours of live content, plus exclusive competitions, musical performances and X Games Extra shows will be streamed on the @XGames YouTube, Facebook and Twitter pages.